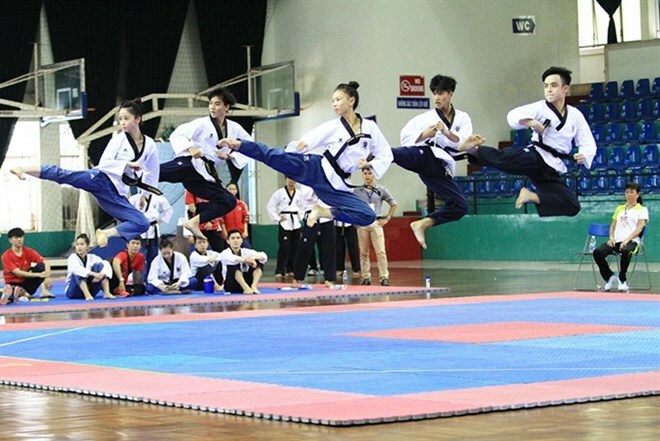 Hanoi (VNS/VNA) - The Vietnamese taekwondo teams will be closely watched during the upcoming SEA Games in Malaysia, with the artists expected to win at least four gold medals. Both the poomsae (performance) team under coach Nguyen Thanh Huy, which is training in HCM City, and the kyorugi (combat) fighters under coach Vu Anh Tuan in Hanoi will have heavy responsibility on their shoulders. Poomsae artists won two gold medals in the mixed doubles and the women’s team events at the last games in Singapore in 2015. They will be expected to defend their top positions this year too, although there have been changes in personnel. Defending champions Nguyen Minh Van and Nguyen Minh Tu of the mixed doubles team have retired. They will be replaced by Chau Tuyet Van and Ho Thanh Phong. While Van has grabbed gold medals in many tournaments in the world, her partner Phong will make his SEA Games debut. Freshman Phong, who will also compete in the men’s team category, is confident ahead of the event. “Each discipline has positive points, which pushes me to challenge myself. I will try my best in both. I am confident, and I feel no pressure to perform,” Phong said. “He is only new to the SEA Games. He has been training with us for four years and has taken part in international events since 2016. He has joined the men’s team with me and (Nguyen Thien) Phung for two seasons now,” Le Hieu Nghia, who won the men’s team silver in Singapore, said. Phong, Nghia and Phung won a gold in the World Beach Taekwondo Championship in May. Earlier, Phong took part in various international tournaments in France, Kazakhstan and Malaysia. Van, along with Nguyen Thi Le Kim and Lien Thi Tuyet Mai, will have to defend the women’s team title. She is not worried about her technique but the quality of referees. In Singapore, Van and her teammates were placed second behind Thailand when a judge made mistakes with the score, leading to lower points for Vietnam. After lodging complaints, the two teams performed again, and Vietnam were announced winners. “My only worry is the referees. However, I will not let it affect my mind. Together with my teammates, we will show the people our unique and best skills,” Van said. The biggest rivals for Vietnam at the SEA Games are Indonesia, Thailand and Malaysia. “My athletes have won gold medals in Asia and the world events. However, SEA Games are different. If they do not try their best, they will not succeed,” coach Huy said. “Indonesia have been growing strongly. Malaysia are the hosts. However, I see Thailand as our arch-rivals. They have received strong support. Under the Republic of Korea’s experts, they got good results in both poomsae and kyorugi in the recent world tournament,” Huy said. “Thailand will present young athletes who are tough, excited and thirsty for victory. However, I have a strong drive too,” Van, who will compete in a world tournament for students in Chinese Taipei before flying to Malaysia, said. In Hanoi, the combat team are giving the final touches to its performance before the SEA Games. Three athletes who triumphed in Singapore are still in the team, and they are ready to fight. Truong Thi Kim Tuyen will be carrying high expectations. In Singapore, Tuyen won her first SEA Games title after beating Irene Therese Bermejo of the Philippines in the final of the women’s 46kg category. She grabbed a silver medal in the World Championship in the Republic of Korea in June this year. In the semi-final match, she beat Thai Napaporn Charanawat, the Olympic bronze medallist, for a berth in the final. Her result is the best for Vietnam ever in a world tournament. “Winning depends on various factors. We must follow our coaches’ tactics, do our best and hope for a bit of luck. The world championship silver will drive me on my way to defending my SEA Games title,” she said. Another medal hopeful in the team is veteran Ha Thi Nguyen, who won a gold in the women’s 62kg in the last Games. Nguyen is a special athlete, as in the 2011 Games in Indonesia, she championed in the U73kg category. Nguyen Van Duy will lead Vietnam’s campaign in the men’s category. He is the defending champion in the men’s 58kg category in the games. Apart from the trio, Ho Thi Kim Ngan is a rising star. The 1.78m tall fighter will compete in the women’s 49kg class. She has the perfect kicks that got her a gold medal in the Asian championship for junior and cadets in 2015. She then grabbed the world title for juniors a year later. This June, Ngan, 16, pocketed a gold at an international tournament in the Republic of Korea. “Based on what we have prepared, we are confident and ready for the games. All our athletes are determined to grab the best results for Vietnam,” coach Tuan of the combat team said. At least 16 sets of medals are available at the Malaysian SEA Games.